The Pusetic brothers, the brains behind the stupendously addictive platform jumper Doodle Jump that has amassed ten million paid downloads, have just released a brand new game that introduces an interesting twist to the original formula. It’s called Doodle Jump: Hop the Movie and is available free for the iPhone and iPad. As the name suggests, it’s a movie tie-in with Universal Pictures’ upcoming live action/CG comedy entitled HopT (trailer below). 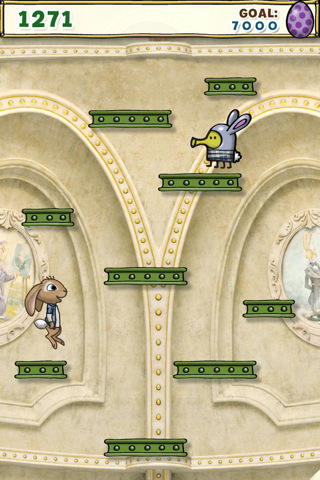 The game has you train the Easter Bunny’s son in jumping across 25 levels set in a candy factory by racing against the familiar Doodle the Doodler character. The game boasts the same tap to shoot and tilt to steer simplicity found in its predecessor, with all the right ingredients like moving, disappearing, exploding and breakable platforms. Doodle Jump: Hop the Movie comes with eight levels unlocked, but the remaining levels unlock one level each day in the run-up to the movie’s release on April 1. It’s a Doodle Jump and it’s free so grab it now, especially if you’ve been wondering why spend a buck for the original Doodle Jump game.